A photo taken through a dusty porthole announces the success of the InSight mission. After a 458-million-kilometre journey, the NASA probe has landed on Mars. It is the fifteenth lander to touch down on the surface of the red planet since 1971 when the Soviet MARS2 vehicle landed and began exploring Mars. Insight separated from the launch vehicle that took it from Earth into interplanetary space, leaving two micro-satellites in orbit to facilitate communications with the base and braved a dangerous descent through the atmosphere of Mars. 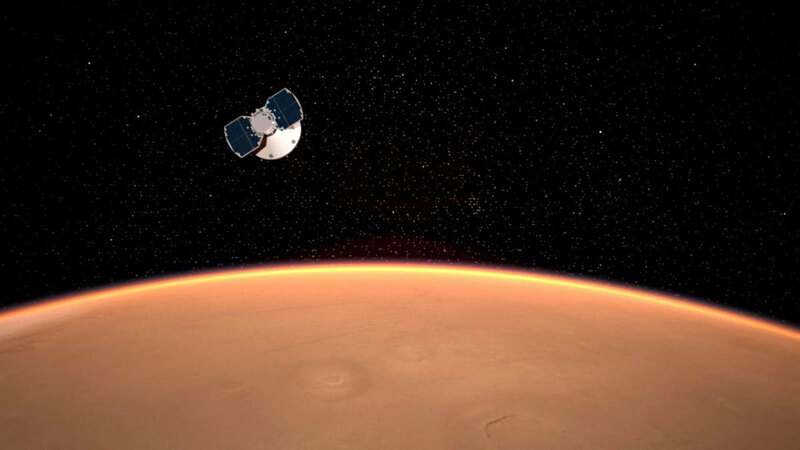 The InSight probe approaching Mars. Credits: NASA / JPL-Caltech. In just seven minutes, the probe jettisoned the heat shield that protected it from the extremely high temperatures due to friction with the atmosphere during the first part of the descent, extended its legs and opened the parachute. It landed on a quiet plain near the equator, unfurled its solar panels and began communicating with the satellites. There are two other vehicles on Mars: the Curiosity and Opportunity rovers. Unlike the rovers, Insight does not have wheels: its purpose is to study the deep interior of Mars to find out whether, like Earth, Mars has a hot nucleus.